Toothpaste manufacturers have commonly included fluoride in their main components for its ability to prevent cavity and tooth decay. Despite its promising actions against tooth decay, it is considered to have adverse effects, especially for young children, that is why many parents and families would still opt for a toothpaste without fluoride. Sodium fluoride or commonly labeled as fluoride is a mineral that is commonly incorporated in toothpaste. It also naturally occurs in water sources. Fluoride has been used for many years to protect teeth and considered to be an important defense against tooth decay and damage. This is because fluoride can restore the minerals in the enamel. When you take too much sugar or acid, the oral cavity may develop an acidic environment and that tends to remove the minerals from the tooth enamel. Once the tooth gets stripped off of these minerals, it will become porous and bacteria will be able to colonize and cause tooth decay. 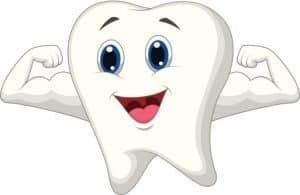 Fluoride may be able to fight tooth decay because they enhance remineralization and help the enamel to be resistant or create a shield against bacteria and acid attacks. Even though fluoride is tagged as a significant protection from tooth decay, it is also deemed to bring harm if ingested even in moderate quantities. That is why, many manufacturers have developed a bunch of natural toothpaste without fluoride. If you are a parent whose goal is to possibly decrease your family’s exposure to harmful substances, you may start with choosing natural products that you’ll be using a lot like natural deodorants, organic supplements, and tubes of toothpaste that are natural and fluoride-free. Use of fluoride has been effective and the most important caries-preventive method since the introduction of water fluoridation in the 1940s (Kargul et al., 2003). That would mean fluoride in toothpaste has been a big part in the prevention of dental caries and maintaining good dental hygiene over the years. An adverse effect associated with the use of fluoride is the development of dental fluorosis. It is a hypomineralization of enamel due to the ingestion of fluoride by young children with developing teeth. Fluorosis may be seen as a discoloration of the teeth that may range from yellow to brown, white markings on the teeth may also be noted. Teeth affected with fluorosis will also tend to have surface irregularities and noticeable pits that will make the teeth feel rough. Other risks of fluoride ingestion include stomach ailments, acute toxicity, skin rashes or perioral dermatitis (for those who have fluoride allergy), and glucose metabolism impairment. 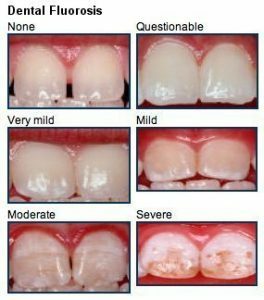 Although the mild forms of dental fluorosis do not pose a public health problem, more severe forms will be of aesthetic concern, especially when the upper anterior teeth are involved. It is therefore very important to achieve an appropriate balance between the beneficial and harmful effects of fluoride (Do and Spencer, 2007). If you have a child who is under three years of age (or who is still not able to spit), then it is advisable to have a toothpaste without fluoride in your stash. Toothpaste with fluoride has known to present certain health risks to young children. A child can swallow too much fluoride especially when they are too young and it’s still tough to teach them how to spit the toothpaste out. When a lot of fluoride is ingested, it can lead to fluorosis (American Dental Association). Other adverse effects may include weakened bones and ligaments. 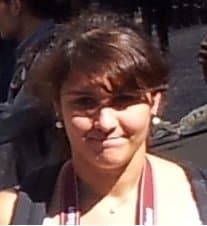 Muscle and nerve problems were also noted. That is why it is best if you let your child use a toothpaste without fluoride. Some people are also allergic to fluoride, and it is another reason to use a fluoride-free toothpaste. Hypersensitivity to fluoride often results in skin eruptions like atopic dermatitis, eczema or urticaria. If you have also experienced gastric distress, headache, and other discomforts when using fluoride, then you should switch to fluoride-free products. If you have medical conditions and tend to have unpleasant reactions to fluoride because of them, then it is helpful if you choose to use fluoride-free toothpaste. It is important that you consult your dentist or physician when it comes to particular conditions. This brand has always been loyal and dedicated to helping others to live a natural life. Their antiplaque and whitening toothpaste has been a family favorite through the years. It is fluoride-free. This trusted toothpaste also does not contain artificial flavors, colors, preservatives and animal-derived ingredients. And this is surely never tested on animals. Many of the consumers loved this fluoride-free toothpaste so much that this has been a staple in their stash. 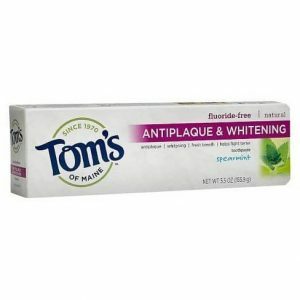 Tons of family who have been trying to use natural products also consistently repurchase this toothpaste from Tom’s of Maine. People love the freshness that this toothpaste brings and how it leaves a clean and polished feeling after you brush your teeth. This toothpaste does not also have an irritating or burning sensation when brushing which most children love. It also does not have that overwhelming flavor that makes you uncomfortable when brushing. It is also effective when it comes to keeping the teeth pearly white. Brushing with Tom’s of Maine toothpaste gives your mouth a instant freshness and clean pearly whites. It also has an awesome taste. Available in: Peppermint, Spearmint, Fennel. The Himalaya brand that started in India has been known for several years because of its organic supplements and natural body products. 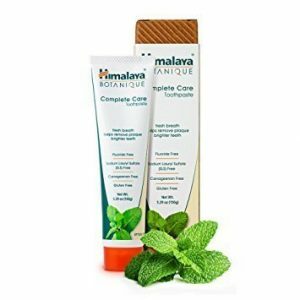 This Himalaya Botanique Complete Care Toothpaste is fluoride-free and free of sodium lauryl sulfate as well. It also contains no carrageenan. The Himalaya Complete Care toothpaste gives you whiter and fresher teeth, and it also helps in removing plaque. Many people totally love the Simply Spearmint variant of this toothpaste. People claim that this toothpaste effectively leaves their mouth feeling fresh and clean after brushing. They also love that this toothpaste is gluten-free and vegan. Other benefits of this fluoride-free toothpaste include fighting terrible bad breath. This toothpaste foams perfectly when brushing without leaving any burning sensation. However, a user said that it might take a bit time to adjust when you have been using a mainstream brand before switching to Himalaya. This toothpaste also has anti-inflammatory properties that can help people who experience red and inflamed gums, it has potent antioxidants too. It is totally safe for use on both adults and kids also. Available in: Simply Mint, Simply Peppermint, Simply Spearmint, Simply Cinnamon. The Jason team continues to create body-loving products since 1959. 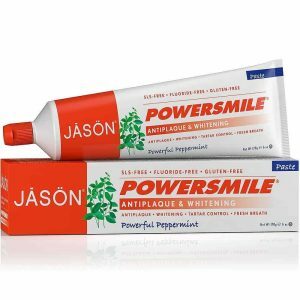 This Jason Natural PowerSmile Toothpaste features a perfect blend of natural polishers and stain-fighting substances. It is SLS-free and fluoride-free and contains no preservatives, no artificial colors, and sweeteners, no preservatives, saccharin, and propylene glycol as well. The Jason Natural toothpaste also does not contain any harmful chemical. Regular brushing with this toothpaste totally helps in preventing plaque and tartar build-up. Many consumers have raved on how much they love the smell and flavor of this toothpaste. And they really appreciate how this toothpaste totally does the job! Some may complain about how strong the Powerful Peppermint might feel like on the mouth, but they still like how this can leave the mouth really feeling fresh and clean. The other benefits of this fluoride-free toothpaste include promoting healthier teeth and gums, fresh breath and its whitening capability. Available in: Powerful Peppermint, Cinnamon Powermint, Vanilla Powermint. This fluoride-free toothpaste comes in a concentrated formula so this tends to last more than the other toothpaste brands. They also have a variety that is foam-free which most families love. The Auromere toothpaste is sulfate-free, vegan, non-GMO, and is made from different Ayurvedic herbal extracts. It also contains no gluten, bleaches, artificial sweeteners, dyes, and animal ingredients. This toothpaste also contains antioxidants such as clove, licorice root, and pomegranate rind. 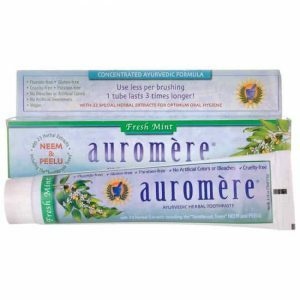 The all-natural botanical extracts and essential oils in Auromére Toothpaste are exceptional because of their astringent, cleansing properties that help freshen breath and leave teeth feeling squeaky clean. One user claimed that this Auromere toothpaste did effectively lighten the tea stains on her teeth. The toothpaste also has a great minty flavor minus the burning sensation that some may experience with other brands. Many consumers love the foam-free variants and the Freshmint flavored one for its refreshing, clean and cool taste. The herbs in this toothpaste also effectively heal and soothe swollen and red gums. Available in: Licorice, Freshmint, Mint-free, Foam-free Cardamom-Fennel (SLS-free), Foam-free Freshmint (SLS-free). Now Foods has been in the natural products industry since 1968. This fluoride-free toothpaste uses Xylitol as the main ingredient, thus the name XyliWhite. Xylitol is an oral-bacteria fighting substance that improves oral health and helps teeth to become stronger and stay pearly white. It also helped in getting and developing healthy gums. 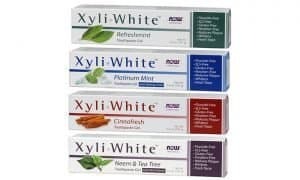 The XyliWhite toothpaste is free from any harmful chemicals and it is formulated only from the cleanest and purest ingredients. The Cinnafresh variant is a top choice among the consumers. It is good in making your mouth feel squeaky clean and fresh although this might not be great for those suffering from sensitivity. Those who have been experiencing sensitivity or certain pain might not love the high amount of xylitol in this product. Too much xylitol might cause irritation for some users. However, this toothpaste is still a good toothpaste for families who prefer using toothpaste without fluoride. Available in: Cinnafresh, Coconut Oil, Platinum Mint with baking soda, Neem and Tea Tree, Refreshmint. 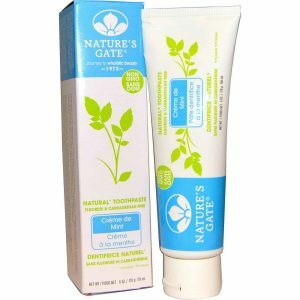 The Nature’s Gate toothpaste naturally and gently polishes and cleans teeth. It also leaves your breath as fresh as possible. This toothpaste is not only fluoride-free but also carrageenan-free, gluten-free, soy-free, paraben-free, sulfate-free, cruelty-free. It contains no artificial flavors or sweeteners and is also vegan and non-GMO. If you are someone who has been using the mainstream toothpaste products for long and worries on adjusting to a natural brand, then you should not worry since many claims that the Nature’s Gates tubes of toothpaste are the easiest to transition to. So, this toothpaste is an awesome option if you are still on the first part in making the switch to using natural products. This natural toothpaste remains effective in promoting good oral health. This toothpaste really gives a clean, healthy, and fresh feeling after brushing. This also did not pose any problems to those who have sensitive gums and teeth. The Creme de Mint seems to be the most famous variant among Nature’s Gate natural kinds of toothpaste. Available in: Creme de Peppermint, Creme de Anise, Creme de Cinnamon, Creme de Mint. Dr. Bronner’s is a known brand in producing amazing products and staying socially and environmentally responsible. They have produced not only wonderful soaps but also an awesome fluoride-free toothpaste. 70% organic ingredients make up Dr. Bronner’s All-One toothpaste. This toothpaste boasts of a low-foaming formula that most families love. It is not only fluoride-free but also cruelty-free as well. This contains no artificial colors, flavors, preservatives, and sweeteners, and is also vegan and non-GMO. This simple and efficient toothpaste effectively cleans the teeth, gums, and tongue leaving your mouth totally fresh and clean. Many people love that this toothpaste is so gentle without any harshness at all. Consumers also claim that these never gives them a taste of any nasty chemicals, just pure freshness, and clean feeling. This is also great for those who have been experiencing sensitivity. 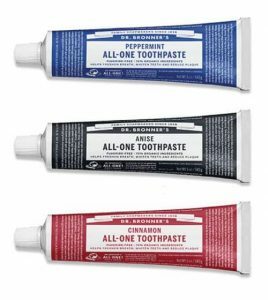 Many of those who have tried Dr. Bronner’s All-One toothpaste have claimed to continually repurchase. The Peppermint variant of this toothpaste is a certified crowd favorite. Available in: Peppermint, Anise, Cinnamon. There is evidence in both ways that fluoride in toothpaste has good and bad effects on its users. Whether you are a pro-fluoride or no fluoride, it is always important that you choose what is best for you and your kids. If you are an avid user of fluoride-free kinds of toothpaste or has been planning to switch, then we hope that we have offered you a great help in your journey to decide in which toothpaste without fluoride will work best for you.